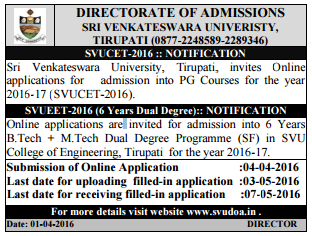 The Online application for SVUCET 2016 is available at website http://svudoa.in. To fill online application, you should have with you. Mobile Phone, SVUCET -2016 Information Brochure and Guidelines, Documents pertaining to your personal details and academic records, Scanned Passport Photo and Signature. f) Then proceed to fill the Name of the Candidate and other personal details with present address and Date of Birth. Please fill the details as per SSC certificate. g) While entering the personal details, please give correct MOBILE number and Email address, because all the correspondence from Admission authority (SVUCET-2016) will be made to Mobile and Email only, No Postal Correspondence will be made under any circumstances. h) After completion of registration details entry, your mobile will receive SMS (OTP) of a security code, please type the security code in the box provided in the registration form and immediately your screen will display a message “verified” in green colour. ii. Now your mobile will receive a message “Your Application is submitted successfully with Appl.No : xxxxx with Payment Ref.Id: xxxxxxxx”. iii. If you want to pay by challan, you have to take a printed copy of the challan and pay the application fee at any branch of SBI / Andhra Bank. After payment of challan, the applicant has to wait for one working day for getting your application successfully registered after which you will receive application to your registered email after 24hours. iv. If you select the online payment and after successful payment is done using Debit/ Credit card / Net banking process. You will get an SMS to your registered mobile number and also get an e-mail to registered email-id with complete application details as PDF file after 24hours. v. You can get a printed copy of registered application at any time using your Application No as User ID and Date of Birth (DD/MM/YYYY) as password using “Print Application” option. This option is only for the candidates who paid the fee. vi. If the candidates apply for a particular test and if found to be not eligible for that test, the test fee paid will not be refunded. Hence the candidates are advised to go through the eligibility conditions carefully given in the instruction booklet before applying.